I like the idea of preventive medicine, one of the stated goals of the Obama administration’s health care reform effort. So I had to give a thumbs up to the Centers for Medicare and Medicaid Services (CMS) announcement last week that Medicare will now cover therapy sessions for people who are trying to quit smoking. This just makes sense. And it’s no small number. About 4.5 million Americans 65 and older smoke according to the Department of Health and Human Services, and another 1 million are younger than 65 but eligible for Medicare benefits. These people could get smoking cessation counseling under Medicare before, but only if it was part of treatment for an existing tobacco-related illness. Which is a lot like closing the barn door after the horse has already taken off. But now Medicare will cover two tobacco-cessation attempts each year – including four individual therapy sessions per try. Medical professionals have been trying to sell the idea that preventive treatment saves health care dollars in the long run for the last two decades. It’s an argument that has mostly fallen on deaf ears, especially in the insurance industry. A lot of that is because it’s very difficult to quantify the amount actually saved by short-circuiting the disease process. It’s easy to say that an ounce of prevention is worth a pound of cure, but the American health care system is based on treating illness, not promoting wellness. But reducing tobacco use is a lot more clear cut. Smoking causes about one of five deaths in the U.S. each year, according to the U.S. Centers for Disease Control and Prevention. 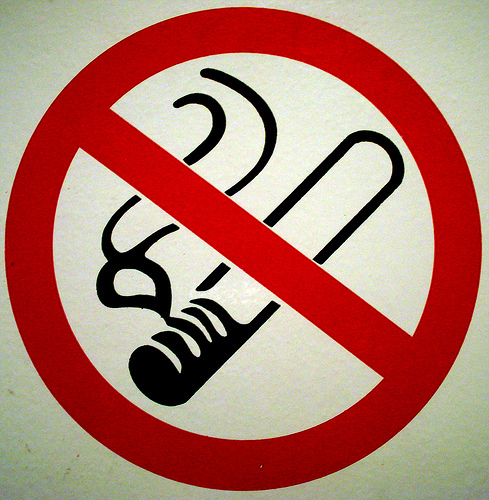 On average, adult tobacco users die 14 years earlier than non-users. Putting it in budgetary terms, CMS figures tobacco-related illnesses will cost Medicare about $800 billion between 1995 and 2015. That kind of savings over a two-decade period can be funneled into other prevention efforts, building a cumulative effect. Then we have Medicaid. About 16 million more Americans will become eligible for Medicaid under the health care reform act passed last March. The biggest enrollment increase will be in 2014, but earlier this month Congress approved $16.1 billion to beef up existing Medicaid programs. Medicaid in particular is a program that focuses on cleaning up the worst of the health care problems after they’ve already boiled to the surface. But it would be to everybody’s benefit if the White House promoted the use of at least some of that money for prevention efforts. I just returned from a two-week vacation, which got me thinking about a subject that fascinated both Albert Einstein and the Chambers Brothers: Time. Seeing old friends from high school and college, some for the first time in a decade, makes you wonder how the time could have flashed by so quickly. In college, 10 years seemed like an eternity; but as you age it turns out to be more like the blink of an eye. But the sentiment echoes. Nieces and nephews who were so recently toddling across the carpet in the family room are now working in downtown high rise office buildings, checking their iPhones at lunch to see if they have any messages from the boss. The big office building where you had your first real job, meanwhile, has been purchased by a university and turned into a museum. Exactly what are the mechanisms that influence perception of time? According to a recent article in Psychology Today, it all has something to do with how we view first-time occurrences versus repetitious events. On the other hand, after one birthday, anniversary or Christmas gets piled on to the next, they become a less conspicuous part of your memory. They start “flying by” because they’re not quite as unique. This concept is based on a book entitled, Why Life Speeds Up As You Get Older: How Memory Shapes our Past, by historian/ psychologist Douwe Draaisma. The book probes the mysteries of memories, how they’re formed when we’re young and how they’re maintained in old age. Why, for example, does someone in his 70s recall events vividly from his 20s but nothing much from his 50s? According to reviews of the book, Draaisma weighs possibilities without coming to any major conclusions. “The mystery remains,” says a writer for the UK Guardian. 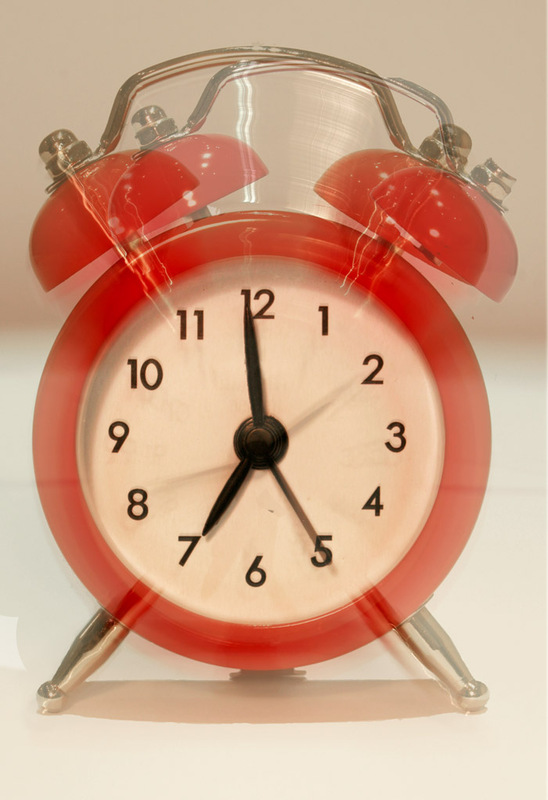 Of course, we live in a consumer society that likes to nudge time along. On my trip I noticed Halloween merchandise began appearing in gift shops on Aug. 1 – not even a month after the Fourth of July flags were put away. The Christmas items arrived from China quite a while ago, and are waiting in the wings for their turn on the shelves. All food products have expiration dates, and I’m now purchasing October and even November items. Summer’s far from over, but the end of the year is in sight. Food product recalls, and cases of food poisoning, have been grabbing headlines over the past few years. Whether it’s beef recalled because of E. coli contamination, or potential salmonella poisoning, outbreaks like these are disturbing because we have an expectation that government should at least be able to monitor the quality of our food and water. A new report out from the Centers for Disease Control has good news and bad news. The good news is that food poisoning cases have been declining since 2007. The bad news is reason behind the drop: The government hasn’t really done anything to improve food quality. It’s just that more Americans are building up resistance to some of the toxins. In 2007, according to the CDC, food related disease outbreaks dropped 8 percent compared with the average number of cases from 2002-2006. There was a 15 percent drop in the actual number of illnesses. Norovirus was the most common cause, representing 39 percent; salmonella came in second at 27 percent. What can the government actually do? The CDC recommends “enhanced food safety training” in restaurants and other establishments that provide ready-to-eat food service. Every restaurant I’ve ever been in has signs in the restroom reminding employees that they must wash their hands. But this is obviously ignored more often than we might imagine. You can’t blame the feds for every incident of unhealthy handling of food in restaurants or supermarkets. It’s up to individual health departments in states and counties. Agents from the Food and Drug Administration inspect plants which produce foods that have a potential for contamination, but there are only about 450 of them to cover the map, according to a recent article in Time Magazine. The kicker is that the FDA doesn’t actually have the power to enforce a recall. It’s been up to producers who have an interest in avoiding lawsuits. The trend these days is to give the government less power to reach into our daily lives. But shouldn’t we make an exception on an issue like this one? 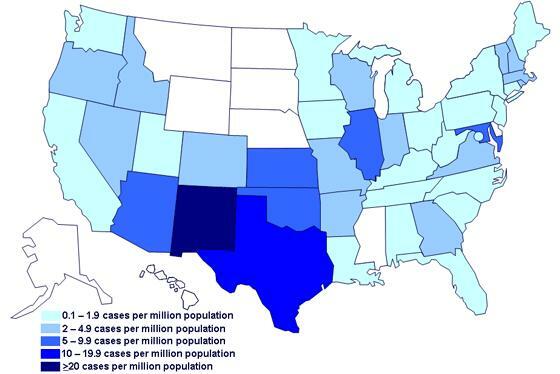 Image: CDC map of cases per million of Salmonellosis, 2008 outbreak. Wikimedia Commons. Discounted medical care can be yours for the asking if you know how to take the right approach with your physician and the practice’s billing department. That idea has been gaining steam over the last two years — but I see it as a fantasy that will never bear much fruit. Yes, health care is a commodity, but it’s not your typical commodity. “Looking to save money on healthcare? Consider asking your doctor for a discount,” a column in last week’s Kaiser Health News suggested. Well, there are actually two separate ideas here. One is that patients should “shop” for a procedure by calling around and taking the lowest price. The other is that people ought to consider talking to their physician about a discount. But in practical application, Americans aren’t really equipped to do either. Most people find medical billing departments to be a frustrating tangle of red tape, even when they’re trying to sort out services that have already been delivered – never mind procedures that you’re only considering. Under the current health care system getting a firm price ahead of time would be quite an accomplishment. Experts also suggest getting the price in writing. Good luck. 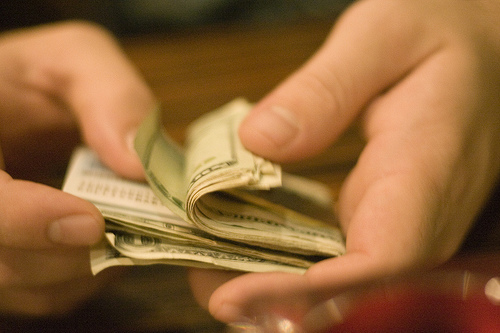 “When negotiating for a better price, remember: Cash is king,” the Kaiser article says. Cash on the barrel head can lead to discounts as steep as 10 percent to 60 percent off for paying cash, according to one quoted source. But people are often intimidated by their doctor. It really takes a lot of moxie to change the subject from your health to hard, cold cash – but that is exactly what you’re expected to do. The New York Times wrote about this last year, when job losses were at their peak and many people were among the freshly minted uninsured. Doctors recommended that patients “respectfully” negotiate their fees, and indicated that physicians would be particularly receptive to arguments if they understood that economic hardship was involved. A cap-in-hand approach may be necessary in some cases but let’s face it, this kind of thing can be very, very uncomfortable. Rather than negotiate, or even shop, more Americans are simply foregoing health care if they don’t think they can afford it upfront. That’s reflected in a Wall Street Journal story published in July, although the newspaper did not cite any statistics. It’s one reason insurers’ profits are on the upswing while some providers, especially medical testing labs, are seeing a drop in utilization. And health care analysts believe the change is here to stay even if the economy improves, since so many people are now going to high deductible plans that saddle them with big out-of-pocket expenses. The only negotiating they’re doing, in other words, is with themselves as they attempt to deal with their own health issues. Health care policy planners have been insisting that patients need to be proactive and access preventive care in order to head off more expensive problems down the road. Instead, it looks like just the opposite may be happening. The perception among Americans is that water quality has improved dramatically after falling to disastrous depths in the 1960s and 1970s. But the newly-released annual report by the Natural Resources Defense Council (NRDC) shows that water quality continues to slip at the nation’s beaches. It is, in fact, hitting new lows partly because of an increase in storm activity, which causes accelerating amounts of runoff into lakes, rivers and ocean beach areas. The NRDC report, Testing the Waters, issued in July, says beach closings were their sixth-highest in 2009 in the report’s 20-year history. 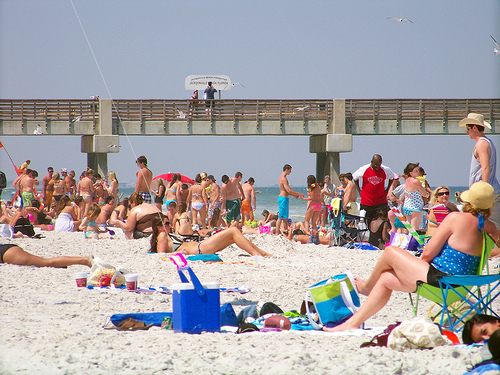 The number of beach closings topped 18,000 for the fifth consecutive year. The culprit is mostly bacterial contamination blamed on antiquated sewage treatment systems. Stormwater contamination adds another dimmension to the mix. Almost 75 percent of the beach closings were due to bacterial levels that exceeded safety standards. When most people think about a day at the beach, they envision laid-back vacation time in Florida, California or somewhere up the East Coast. I’ll get to Florida in a minute, but the NRDC report contends that the beaches throughout the Great Lakes are in an alarming state. It’s strictly swim at your own risk in places like Wisconsin, Illinois and Michigan. “The Great Lakes are severely stressed by aging, overwhelmed and broken by infrastructure, as well as a rapid increase in violent storms resulting from climate change and an increasingly dangerous onslaught from invasive species,” the report’s authors, Mark Dorfman and Kirsten Sinclair Rosselot, write. In other words, it might be best to stick to the volleyball court. Florida has some world-class beaches and they have a pretty good international image. In my neck of the woods, which is the stretch of the southeast coast from Boca Raton up to Jupiter, the water quality tends to be pretty stable – there were no beach closings at all in 2009. But head down to the Keys if you want to see what real trouble looks like. During the height of the mania surrounding the Deepwater Horizon oil spill in May and June, there was justifiable concern about the fine beaches of the northern Gulf. But there was real panic that the beaches in the Keys would be fouled. I received a call from a long-time friend, an attorney who lives and works in the Great Lakes area, who said what a shame it was that the “pristine” beaches of the Keys might be damaged. Any oil in the Keys would be an environmental horror story, to be sure. Swimming in contaminated water, by the way, can cause intestinal illness, respiratory problems and skin irritation. So warnings are important, but there’s often a 24 hour lag time between water testing and safety advisories. Starting in 2012, the Environmental Protection Agency will finally upgrade beach water quality standards for the first time in 20 years. One result will be same-day water testing leading to quicker advisories. As for getting to the root of the problem though, which is outdated sewage and runoff infrastructure, I am not exactly riding a wave of hope. With state and local budgets already strained – and a seemingly unstoppable tide of belt-tightening at the federal level – it may be a while before a day at the beach comes without a warning label.